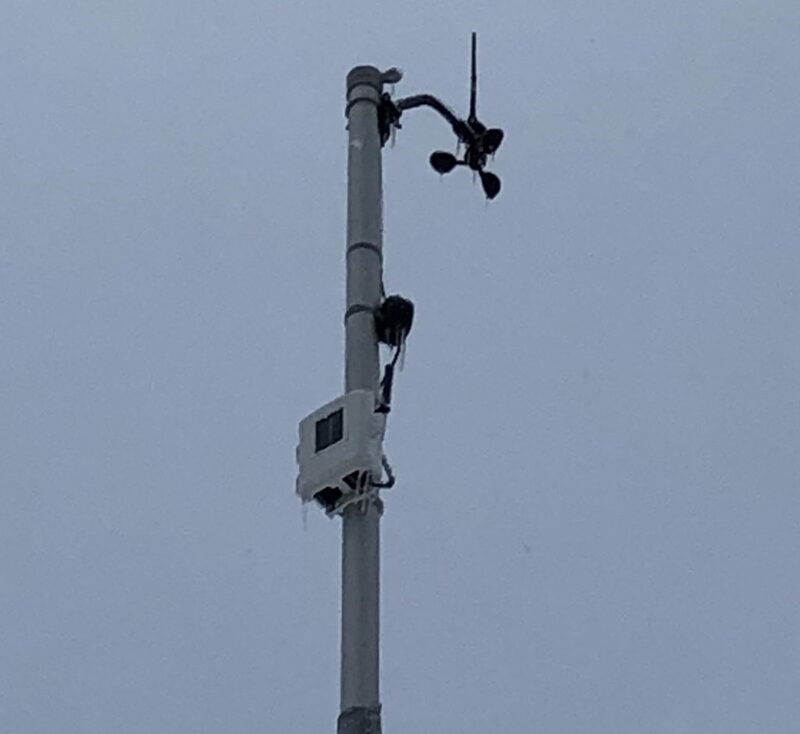 February 24, 2019 February 25, 2019 by John W.
Measurement site is now open (as of 3 pm Monday) & ready for the next precip event! The snow measurement site is currently blocked by 4+ ft drifts. Will dig out this afternoon. But I was able to see from a distance that only a trace of snow has fallen since the last report at 10:40 pm Sunday (at which time I body surfed through the snow to reach the gauge). Winds should really start to fall off after noon today (Monday). Our storm total from Saturday morning thru Sunday night is 12.3″ of snow. Likely we got a few additional inches but they found a home in nearby drifts. Just recorded another low-ish snowfall measurement of 0.9″ at 10:40 pm. Can’t keep snow on the board. As of 11 pm it appears that winds may have peaked in the 8 pm hour. Each successive hour has had a lower average wind speed. Last snow measurement of 1.2″ (representing snowfall between 7:30 am – 2:05 pm) is low. Unfortunately, snow is being blown off the collection surface. I left some snow on there so hopefully the incoming snow will stick to it. But with almost horizontal snowfall, it’s tough to measure! It all wants to collect in a drifted pile somewhere. It’s possible we could break our station wind record (49 mph) in the next 24 hours. We received some freezing rain overnight. About 0.2″. From what I could see, though, power lines and tree limbs were unaffected — no ice accumulation. Probably too much wind and too warm to stick. The really cold temps don’t hit until later tonight. Almost an entire February’s worth of precipitation fell in the 24 hours ending 7:30 am Sunday: 1.22″. Normally we receive about 1.3″ of melted precipitation for the month. We’re now at 4.99″ for February 2019! February 15, 2019 February 16, 2019 by John W.
Due to a combination of intense recent snowfall, high winds, and limited space, we have nowhere to place a snow board where it is not subject to significant drifting. The city has become a labyrinth of snow piles that powerful lake winds are merging and leveling. Therefore, effective 11 AM Friday 2/15, we are suspending snow measurements indefinitely. Once the winds subside and/or the peaks reduce/even out we will resume snow measurement. Given the forecast of sunny to partly sunny days this weekend and limited snowfall in the next several days, hopefully that will happen by next week. Note: a liquid equivalent reading taken from our gauge will continue to appear in the precipitation tables on our History page. [UPDATE Saturday 2/16/19]: I have relocated a snow board to be further from any potentially drifting high spots to the north and northwest (two of the most common direction for snow in the winter here). After knocking on wood, I am now reinstating measurements. I have added 2″ to yesterday’s snow total as a minimum estimate of what fell after 8AM.